The body of a four-month-old puppy has been found dumped in a bin with a broken neck and leg. 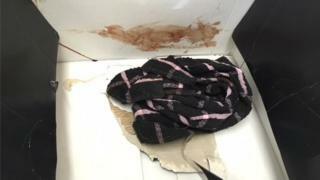 It is thought the Staffordshire bull terrier-type dog, who had blood on his neck and face and puncture wounds, had been attacked prior to its death. He was found wrapped in fabric inside a Tommee Tippee bottle steamer box in a communal bin in Newcastle-under-Lyme, on Tuesday evening, the RSPCA said. Officers are appealing for information after the "shocking discovery". The dog was not microchipped so an owner has not been traced. RSPCA inspector John Groarke said: "The injuries point to the pup having a violent end to his life, possibly after being attacked by another dog." Anyone with information could contact them in confidence, he added.